“OPB” redirects here. For other uses, see OPB (disambiguation). OPB is also a major producer of television programming for national broadcast on PBS and Create through distributors like APT, with shows such as History Detectives, Barbecue America, Foreign Exchange, Rick Steves’ Europe, and travel shows hosted by Art Wolfe. KOAC Radio won OPB’s first Peabody Award when it was recognized for Outstanding Public Service by a Local Station for a 1942 program called Our Hidden Enemy, Venereal Disease. KTVR-TV in La Grande went on the air December 6, 1964 as a commercial television station that affiliated primarily with NBC and also carried select ABC network programs. KTVR operated as a semi-satellite of Boise, Idaho station KTVB, but had a La Grande studio at 1605 Adams Ave., producing a nightly newscast and other local programming. However, by 1967, the La Grande studio and office had been closed and KTVR became a full-fledged satellite of KTVB. KTVR was unique in the Pacific Time Zone, because as a repeater of a Mountain Time Zone station, its “prime-time” schedule was broadcast from 6 to 9 p.m. OEPBS bought KTVR on August 31, 1976 and converted it to PBS on February 1, 1977. At first, KTVR rebroadcast programming from KWSU-TV in Pullman, Washington and KSPS-TV in Spokane, Washington until OEPBS completed a transmission link to La Grande. On September 1, 1977 OEPBS took KTVR off the air for transmitter repairs, due to increasing technical problems. KTVR returned to the air on January 1, 1978, carrying OEPBS programming for the first time. KOAB-TV in Bend began broadcasting on February 24, 1970 as KVDO-TV, an independent station licensed to Salem. Channel 3 struggled to compete with Portland‘s established independent, KPTV (channel 12), and in 1974 the station was purchased by Liberty Communications, then-owners of Eugene’s ABC affiliate KEZI (channel 9). The intention was to make KVDO a full-power satellite of KEZI. KATU (channel 2), Portland’s ABC affiliate, responded by taking legal action, forcing KEZI to instead operate KVDO on a limited basis. OEPBS purchased the station on February 19, 1976, and turned the station into a PBS member station, rebroadcasting OEPBS programming that was already available from KOAC and KOAP (now KOPB). A few days later on February 28, 1976, a disgruntled viewer protesting KVDO’s sale to OEPBS cut guy wires, toppling the channel 3 transmitter tower. 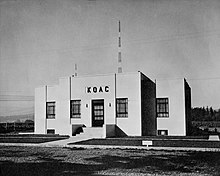 On September 20, 1976, KVDO signed back on the air with a new tower. On August 6, 1983, after many complaints about duplication of service to Salem-area viewers (see above), KVDO was shut down. OEPBS petitioned the FCC to move Channel 3’s license and channel allocation to Bend, which had no PBS coverage; the FCC honored their request. On December 22, 1983, channel 3 signed back on the air as KOAB. The call letters were modified to KOAB-TV when KOAB-FM signed on the air January 23, 1986. KOAC won a 1972 Peabody Award for a program called Conversations with Will Shakespeare and Certain of His Friends. KEPB-TV in Eugene began operation on February 27, 1990 as Eugene’s first public television station, bringing most of Eugene a clear signal for PBS programming from the first time ever. Although KOAC-TV had long claimed Eugene as part of its primary coverage area (Corvallis is part of the Eugene market), it only provided rimshot coverage to most of Eugene itself, and was marginal at best in the southern portion of the city. For 2001 and 2002, the Oregon state government provided about 14 percent of OPB’s operational budget; for 2003 and 2004, it was cut to 9 percent. In 2007, OPB Radio added World Have Your Say (WHYS) to its schedule, with its listeners becoming the show’s most numerous contributors from the United States and second in number worldwide only to Nigeria. According to WHYS host Ros Atkins, a “significant number of listeners [disliked the] ‘tone’ and ‘production'” of the show, resulting in the removal of the show from OPB’s schedule after three years. On December 4, 2007, OPB launched OPBmusic, a 24-hour online radio channel spotlighting Pacific Northwest musicians. In March 2009, the Corporation for Public Broadcasting chose OPB to manage the pilot version of American Archive, CPB’s initiative to digitally preserve content created by public broadcasters. OPB’s first digital channel was OPB CREATE (an affiliate of the Create network), announced in January 2006; its availability was limited to certain Comcast digital cable customers and on Clear Creek Television in Oregon City. All of OPB’s digital channels are also available on cable providers Comcast Xfinity, Charter Spectrum and Frontier FiOS, and three other providers serving specific regions and communities in Oregon: Clear Creek (a cooperative serving the Redland area of Oregon City), BendBroadband (serving Central Oregon), and Crestview Cable Communications (serving Madras, Prineville, and La Pine). KOAC-TV shut down its analog signal, over VHF channel 7; the station’s digital signal relocated from its pre-transition UHF channel 39 to VHF channel 7. KOPB-TV shut down its analog, signal, over VHF channel 10; the station’s digital signal relocated from its pre-transition UHF channel 27 to VHF channel 10. KEPB-TV shut down its analog signal, over UHF channel 28; the station’s digital signal remained on its pre-transition UHF channel 28. Through the use of PSIP, digital television receivers display the station’s virtual channel as its former UHF analog channel 28. KOAB-TV shut down its analog signal, over VHF channel 3; the station’s digital signal remained on its pre-transition VHF channel 11. Through the use of PSIP, digital television receivers display the station’s virtual channel as its former VHF analog channel 3. KTVR shut down its analog signal, over VHF channel 13; the station’s digital signal relocated from its pre-transition VHF channel 5 to channel 13. Since the spring of 2009, OPB has operated jazz radio station KMHD; the station is owned by Mount Hood Community College, but operates out of OPB’s studio facilities in Portland. ^ a b Kristi Turnquist (March 31, 2010). “Oregon Public Broadcasting wins Peabody Award”. The Oregonian. Retrieved 2010-08-13. ^ ““Our Hidden Enemy—Venereal Disease” for Outstanding Public Service by a Local Station”. Retrieved June 16, 2017. ^ “History of Oregon Public Broadcasting”. OPB. Retrieved 2014-07-31. ^ “Don’t reduce funding for public broadcasting”. The [Bend] Bulletin. April 10, 2007. Retrieved 2010-08-13. ^ a b Ros Atkins (4 June 2010). “Farewell to OPB”. World Have Your Say blog. BBC. Retrieved 2010-08-13. ^ Kristi Turnquist (December 11, 2007). “OPBmusic launches”. The Oregonian. Retrieved 2010-08-13. ^ “The Corporation for Public Broadcasting Selects Initiative Manager for American Archive Project”. Corporation for Public Broadcasting. March 26, 2009. Retrieved 2010-09-14. ^ “2014 – 51st Annual Emmy® Recipients”. OPB. Archived from the original on 2014-07-14. Retrieved 2014-07-31. ^ a b c d “Channels”. OPB. Retrieved 2013-02-25. ^ “DTV Tentative Channel Designations for the First and Second Rounds” (PDF). Archived from the original (PDF) on 2013-08-29. Retrieved 2012-03-24. ^ “How To Listen”. OPB. Retrieved 2014-07-31. ^ “About KMHD”. OPB. Retrieved 2014-07-31.